The Town of Grand Rapids is proud to announce its ranking as the 4th Safest Town in Wisconsin according to the 2015 ValuePenquin Report and 5th by the 2015 Niche Report. We are also proud to have been named 20th of the Best Towns to Raise a Family in Wisconsin by the 2015 Niche Report. 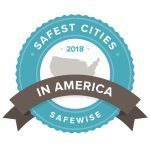 In addition to the above recognition, the SafeWise Report has recently released its 2018 "50 Safest Cities in Wisconsin" report, ranking Grand Rapids as the 7th Safest City in Wisconsin, and also the 82nd Safest City in the nation. To compile this report, SafeWise used the most recent FBI crime data from 2013 to analyze and rank these cities, which all have a minimum population of 3,500 people. "Not only are 68 percent of these cities on our list for the second time, but 48 of them reported zero murders in 2013," SafeWise security analyst Rebecca Edwards said. "The communities on this list are a great example of the difference concerned citizens can make in keeping their town safe." This is a community honor attributable to the cooperation and leadership of many. The residents of Grand Rapids, town employees, Police Department, Fire Department, town crew, Town Board and all the various town committees played a significant part in achieving these recognitions. Centrally located for those employed in nearby communities, Grand Rapids is the 13th largest Town in Wisconsin and the 3rd largest community in Wood County. Covering 20.3 square miles, Grand Rapids is home to 7,748 residents. Regulated growth has resulted in development of subdivisions with over half-acre, pine and oak-forested lots, providing a suburban lifestyle. As evidence of the water quality in the Town, half of the municipal wells serving Wisconsin Rapids are in Grand Rapids. We are proud to offer our residents an excellent quality of life, including primary law enforcement, road maintenance, and a volunteer fire department with a modern and up to date station. The five member Town Board meets monthly. Annual Town meetings give all town residents a vote in major decisions. Persons from all over Wisconsin come to Grand Rapids to enjoy and participate in events held within the Town. In addition, South Wood County Park on beautiful Lake Wazeecha offers opportunities for hiking, bicycling, fishing, swimming, disc golf, picnics, camping, and boating.